The first part of Sarah Palin's evolution occurred before the existence of this blog. Therefore, we will start with part 2 of what will probably be 4 or 5 parts. The first part of her evolution of course is her career as Mayor of Wasilla, Governor of Alaska and Vice Presidential Nominee for John McCain. In that portion of her evolution, we watched a wildly charismatic woman with a deep interest in Alaska's greatness meet her full blown American patriotism on the national stage and electrify the base of a party that seemed to be on its last legs. Now it's time for Part 2. This is where Sarah Palin is given the opportunity to make a second impression against the backdrop of the lies and the politics of political destruction that dogged her through the 2008 presidential campaign. Those who follow and support Sarah Palin know who she is. Those who bought into the media malpractice or drew their own conclusions due to lack of research and the surrendering of their brains to the mainstream media are the ones who will see this as a re-branding. 1.The mainstream media will comment that Sarah Palin has astounded pundits and media people with a maturity, confidence and depth of knowledge that many though she could never display. Yet they will continue to tell us that she will never become president. Leave it to the mainstream media to make a few bucks off of someone they don't think is viable. 2.Palin supporters will comment that they are not surprised by the maturity, confidence and depth of knowledge that she displays. 3.Old guard elitist Republicans, moderates and independents will admit that Sarah Palin has done herself well in the PR department and while they won't come to say just yet that they see her as the savior of or the future of the GOP, they will admit that if she works hard and pulls it off that they wouldn't rule it out. In football, that's called punting. 4.The liberals will get scared again and in backroom meetings will decide that they have to take a more serious approach toward opposing Palin. Her emergence as a "beefed up" Sarah will cause the liberal movement and the Democrat party to go to DefCon4. While privately they will be taking her very seriously, publicly they will continue downplaying her chances. They will run ads against her, write op-eds and give statements in such a way as to portray her as a right wing extremist who doesn't pull a big enough plurality to win on the national scene. Ultimately, though they will admit she is a danger to the progressive movement as their ratcheted up attacks fail. I caution Sarah Palin supporters not to draw the conclusion that now that she is a media sensation that the nasty attacks, satire and caricaturing has come to an end. Newsweek is the freshest example of that. Always remember that Ronald Reagan was lampooned in the popular culture throughout his presidency. There was a left wing presence that simmered under the surface undermining him and trying to catch him at every turn until his last day in office. This will always be the same for Sarah Palin. Her detractors will hate her right up to the day she dies. They will be unashamed in the means and tactics they will use to try to undermine her and cast her in a negative light. Yes, the Alaska bloggers, the media and the left in America will continue to oppose Sarah Palin. But, a majority of the American people are about to be reminded that Sarah Palin was the most brutally abused and most unfairly characterized political candidate in the history of modern politics (she surpasses Reagan in this category only because there was no internet or social media in his day). As such, although it can't be called a sympathy vote, she will earn the respect of many of the uncertains for having stood tall through all that she has been through. That should lead us to her evolution, part 3, and her national political campaign. Her studious embodiment of the principles and spirit of Ronald Reagan positions Sarah Palin well to become the "teflon mom" just as Reagan had become "the teflon president." She will survive the smearing and the mocking. It is what she does in the future that will determine whether her outcome is successful, not what has been done to her in the past. Those who underestimate her do so at their own peril. This is not about narcisism, feel good hero worship or the capitalization on celebrity status for financial gain. This is about the future of the United States of America. Sarah Palin knows that. It is simply political protocol that she not say this until after the 2010 elections. The fact that she is discussing policy on her Facebook page and will be doing more in depth policy interviews later in the week is indicative that she's not leaving the political arena, and that this book tour is not her way of lining her pockets before telling America to go screw themselves after the nonsense in Alaska and the ridiculous crap in the national media during the 2008 campaign. Sarah Palin is not going through all of this because of some selfish motive or financial agenda. She is doing this for us Americans who know that if it's been done before, it can be done again. 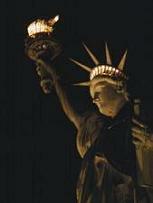 This country can be a shining city on a hill and a beacon of freedom for the world. There is a cause more important than Sarah Palin's personal gain that drives the woman who believes that she should act "with a servant's heart." We have come too far as a nation to allow socialists and radicals to re-make this country in an image that is unrecognizable to those who understand our underpinnings in the Constitution and Declaration of Independence. Ronald Reagan did so much to bring us out of a similar darkness as this once before. His efforts and his accomplishments CANNOT go to waste! Sarah Palin is the answer whether the media likes it or not.